The Dutch composer Robin de Raaff has four symphonies to his name. Will De Raaff follow in the footsteps of tradition, or will he give the name, the form, a new meaning, a new direction? His symphonies have little to do with the classical concept. Of course, his love for composing was partly derived from the symphonies of composers such as Brahms, Mahler, Shostakovich, Prokofiev and even Bernstein, but De Raaff is too much of a constructivist to write a symphony in the classical sense of the word. De Raaff became more and more convinced there was something to be gained in the concertante form, the orchestra and the soloist, the individual and the crowd. He shies away from prescribed forms and developments, a recapitulated theme followed by various movements with different characters. The symphony, the orchestral apparatus sounding together, telling its story for a period of at least 20 minutes, is what he took as his starting point. Working from there, this led to a reinterpretation of the symphonic form. De Raaff’s Second and Fourth Symphonies are the result of a reinterpretation of works for a soloist or soloist group with accompaniment. They are a revision of the material, reminiscent of the way in which Pierre Boulez let Incises for piano grow into Sur incises for ensemble and how Luciano Berio recomposed a number of his Sequenzas into Chemins. "The result is ultimately a very personal kind of expressionism that is never less than impressive and sometimes beautiful, sometimes overwhelmingly violent. The enormous orchestra is handled with extreme virtuosity." "Magnificent how De Raaff, in his Second Symphony, lets the Raschèr Saxophone Quartet rise gently from a mist of high violins and harpses. Or how, in his Fourth Symphony, he translates Emily Dickinson's 'How Still the Bells' into weightless tinker textures." "First of all, there is the Cello Concerto in five movements. Cellist Marien van Staalen, who is also playing on this record, describes the work mainly as innovative and challenging. It is technically very challenging for the musician because different keys and dynamics are interwoven and alternated. This also makes it an exciting exercise for the ear of the listener." "Expert without being explicitly artful and expressive without becoming theatrical." 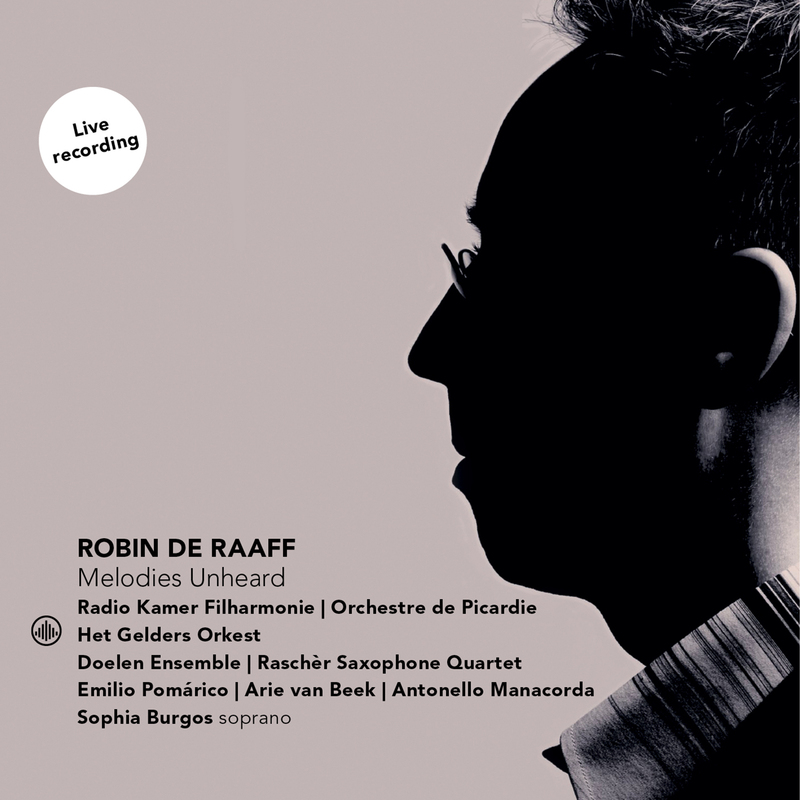 "This recording shows that De Raaf composes the best orchestral music you can imagine today. Extremely solid, convincing, imaginative and powerful neo-expressionist. Impressive! Bravo, Robin!"